To all my loyal visitors, you may have noticed that I have not been blogging for a while in recent months. This is due to health issues, and I have been resting since and have been putting off posting on here for the time being. 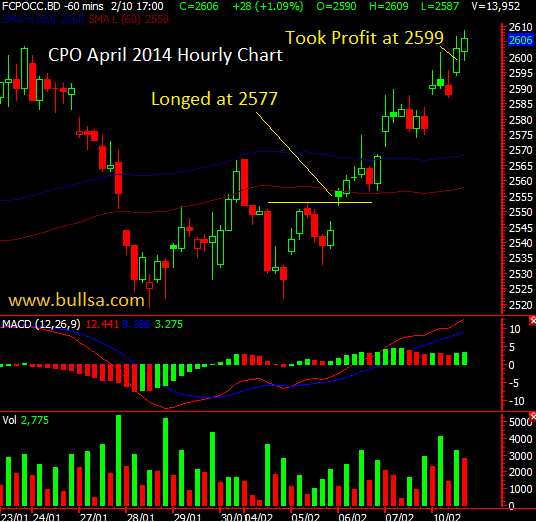 I exited the trade to take profit at 2599 with 40 points gain. It might continue the surge. I guess it is enough for me for now. 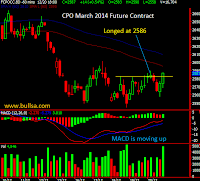 I initiated long CPO April 2014 Future Contract at 2557 for 1 contract at the open. 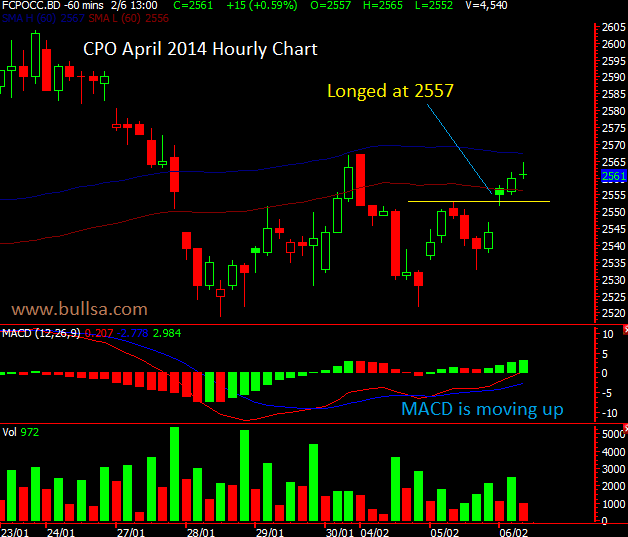 MACD is moving upwards. There is a potential for the rebound. 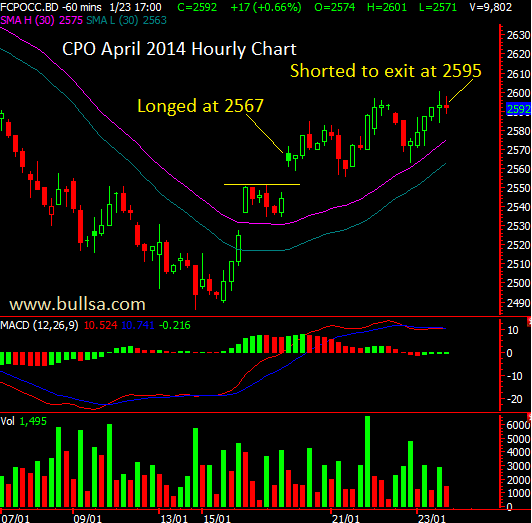 I exited my trade at 2595 with a gain of only 26 points for my first trade of the year. The price might continue surge, 26 points is good for me for now. 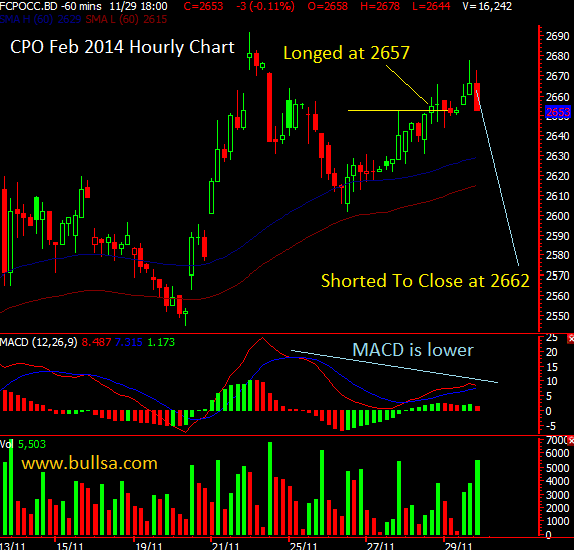 I initiated long position at the open when the price opened with gap at 2567 with 1 contract. 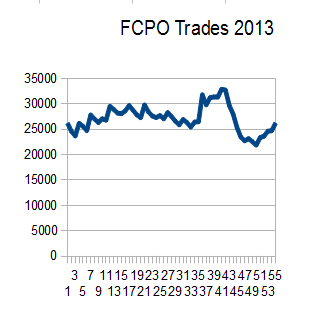 My FCPO 2013 Performance - FLAT! 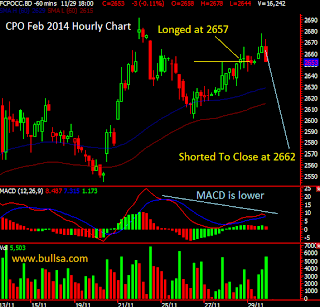 My opening balance for FCPO was RM 26,175 in 2013. After a long and stressful trades for the whole year, my account managed to break even at RM 26,200 (slightly positive by RM 25!). I actual made up to RM 32,875 and for some reasons, the trades went south making me string and string of losses all the way to the low balance of RM 21,875. The few bad trades enough to kill all my 'should have' profit of the year. In trading, anything can happen. When experiencing big win, we should BECOME very CAUTIOUS to preserve our profit. 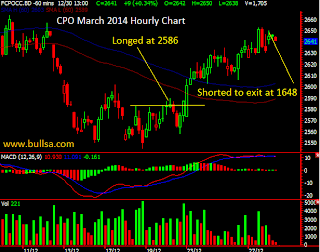 This is the lesson I learn from 2013 FCPO Trades. 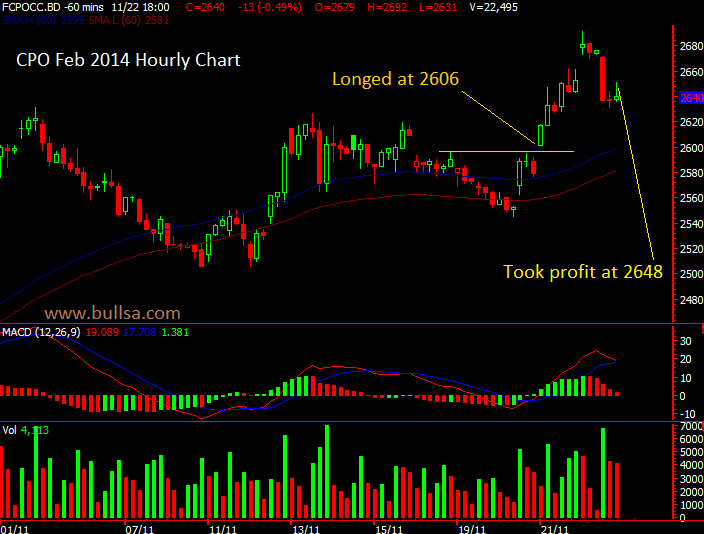 I have been quiet in FKLI trading with the reason that FKLI has no pattern. A pure chartist would find it hard to trade. I only managed have only trades for the whole year. Well, at least it is positive. I am happy actually. My initial balance at the beginning of 2013 was RM 13,675 and I managed to a little profit of RM 4,150 to RM 17,825; a positive performance of 30.35%. 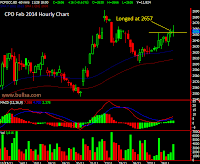 I exited the trade at 2648 with a profit of 60 points this morning when the market open. The surge of the price seems not strong and it has been 10 days since I initiated the trade. 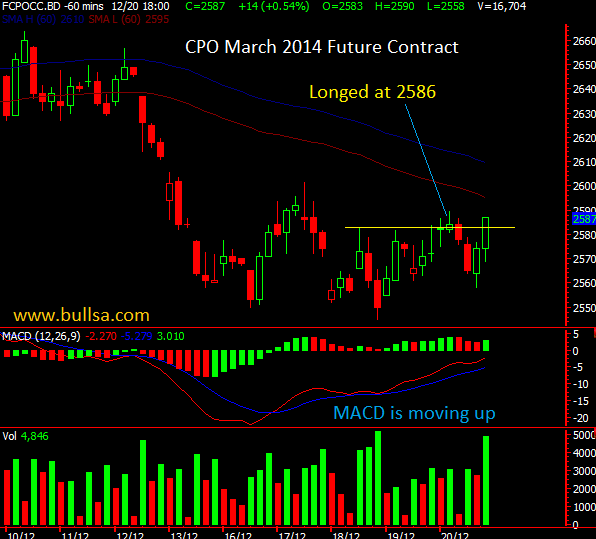 I initiated long position for CPO March 2013 Future Contract at 2586 for 1 contract. 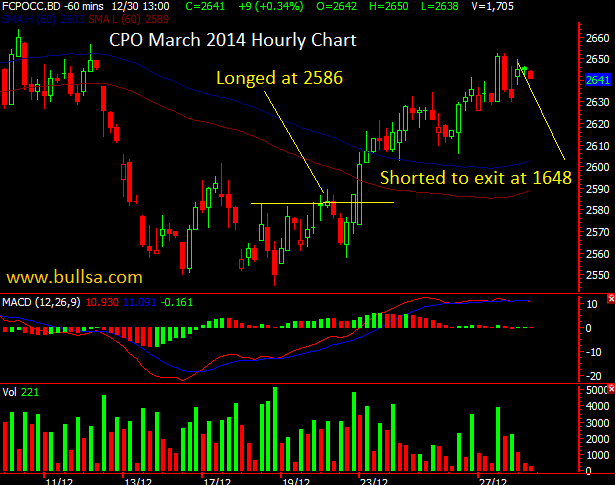 I closed my long position at 2662 with little gain of 3 points. 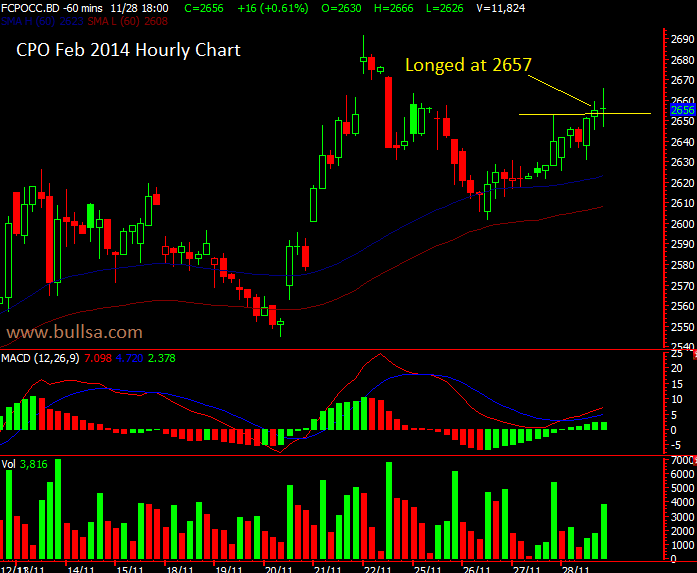 I initiated long position at 2657 for 1 contract. The uptrend could continue. The market behaved volatile couple with weekend ahead. Confirming the trade seemed to be a good bate. 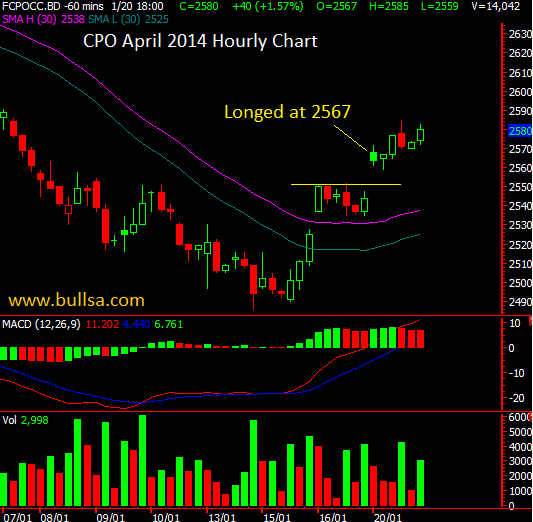 I initiated long position of CPO Feb 2014 for 1 contract at the open at 2606. 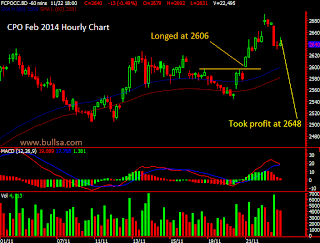 ( I placed buy order at 2610 before the market open and I was filled at 2606 ).